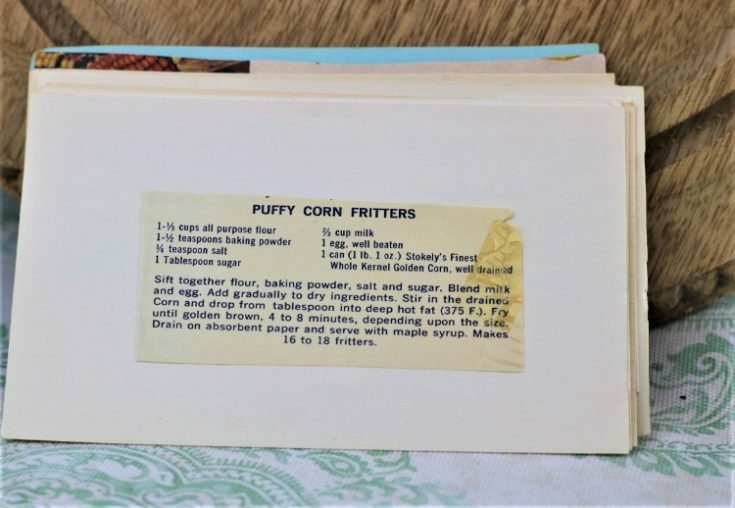 Front of the recipe card for Puffy Corn Fritters. 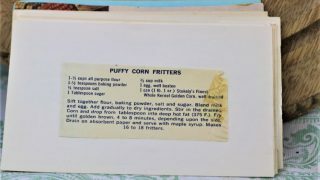 There are lots of fun recipes to read in the box this recipe for Puffy Corn Fritters was with. Use the links below to view other recipes similar to this Puffy Corn Fritters recipe. If you make this Puffy Corn Fritters recipe, please share your photos and comments below! Add gradually to dry ingredients. Stir in the drained Corn and drop from tablespoon into deep hot fat (375 F.). Fry until golden brown, 4 to 8 minutes, depending upon the size. Drain on absorbent paper and serve with maple syrup. Makes 16 to 18 fritters.